The British approach with creativity to everything, even when it comes to restrooms. 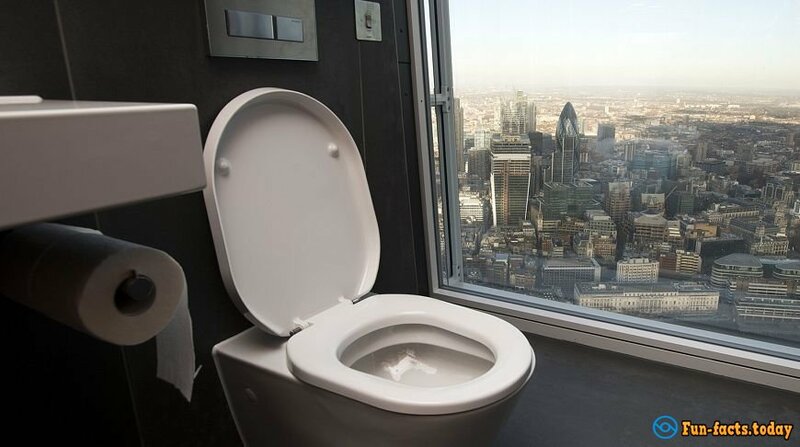 From space capsules to the underground tunnels - we will tell you about the most unusual toilets in the capital's institutions! The Metropolitan Restaurant sketch itself is a rather unusual place: it impresses with its colorful design. Pink furniture and interior in Art Deco style - the first thing that catches the eye in the institution, but gets ready for more and more. Local restrooms will surprise you as much as colorful decoration. 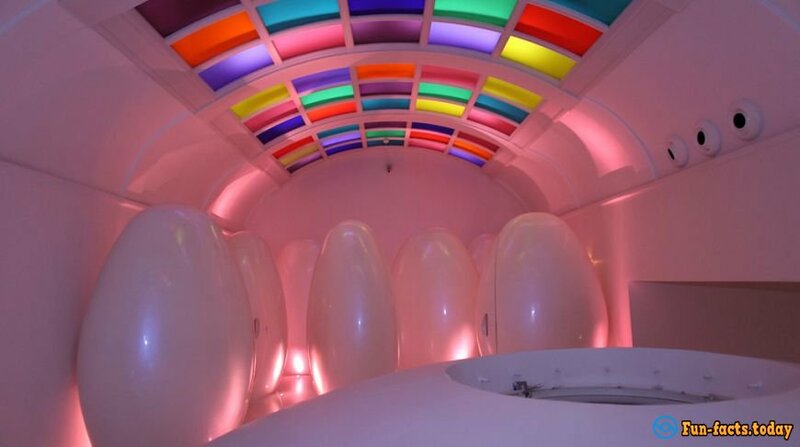 Toilets in sketch look like oval capsules, and they create a feeling that you are on a spaceship. It is quite futuristic. If you are not afraid of the dark underground rooms, then you will like a French restaurant The Bonneville Tavern. The interior is, frankly, frightening: dim lighting, wooden furniture, and shabby walls. But be sure - this is not the worst. When after drinking cocktails (and they are also very unusual), you will need to absent yourself in the restroom, gather all your will into a fist. Stairs will lead you even further - to the dungeon, where on the way to the toilet, you will walk down the hall with brick walls and by cells with skulls. Where: 43 Lower Clapton Road. In this restaurant, everything is at a height, in the literal sense of the word. It is located on the 31st floor of a skyscraper. The Shard is popular thanks to its panoramic windows. Such a view of the city can be found not in every institution. But the main "trick" is latrines with such panoramic windows with the same beautiful overview. 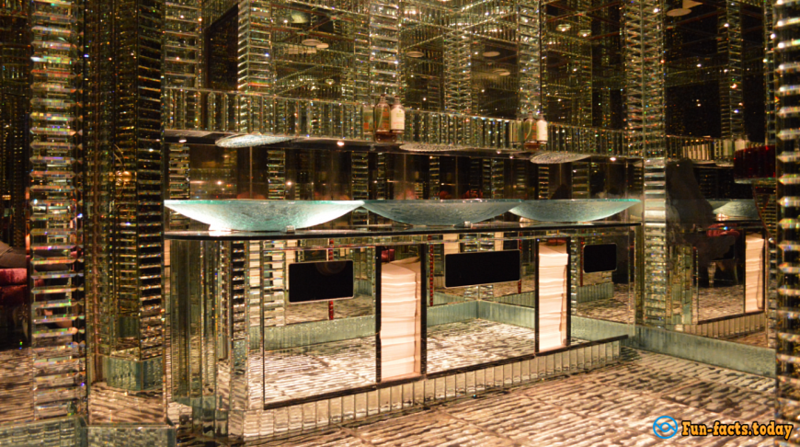 The Crazy Bear Club in the metropolitan area of Fitzrovia is different glamorous interior. Everything is exquisite: expensive items of décor and furniture, first class service and unique position in the menu. This place does not cease to surprise outside the hall - even in the bathroom. There you will not leave feeling that you are in a jewellery store - so all around sparkles and glitters. The main thing is not to get lost in this entire splendor. At first glance, this place is nothing impressive, except, of course, delicious Mediterranean and Asian cuisine. The interior is quite normal. But designers tried their best on the design of latrines. 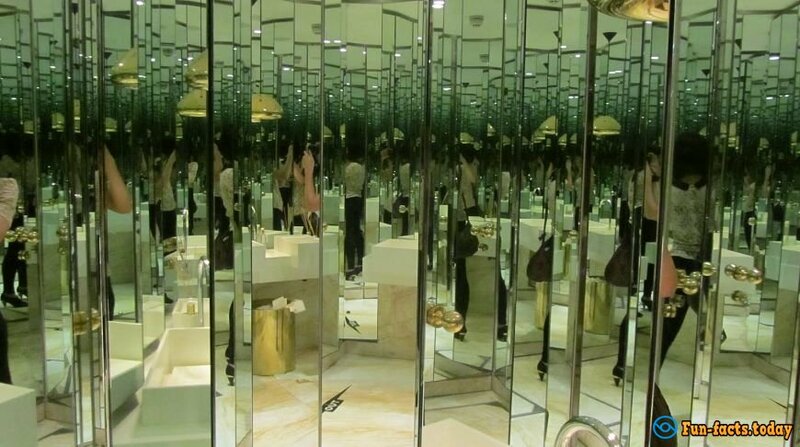 It is extremely dangerous to come back after a couple of cocktails because the mirror will confuse you.